Here's my new tshirt that I got at the Formula Xtreme racing last weekend at Eastern Creek. Modelled by my beautiful 3 year old. She said its a "skirt". 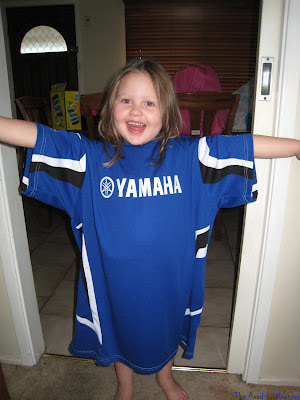 Maybe she will become a one eyed Yamaha fan as well. Yamaha...cough cough, cute kid though! Hope you have your shotgun handy, she is going to be breaking some hearts. Yeah I think I am going to need several shotguns. Cute picture, she's pretty tall for 3. She will be 4 in June. And both myself and her mum are almost 6 foot each.